After he had washed their feet, had put on his robe, and had returned to the table, he said to them, “Do you know what I have done to you? You call me Teacher and Lord–and you are right, for that is what I am. So if I, your Lord and Teacher, have washed your feet, you also ought to wash one another’s feet. For I have set you an example, that you also should do as I have done to you. Very truly, I tell you, servants are not greater than their master, nor are messengers greater than the one who sent them. If you know these things, you are blessed if you do them. Jesus said, “Now the Son of Man has been glorified, and God has been glorified in him. If God has been glorified in him, God will also glorify him in himself and will glorify him at once. Little children, I am with you only a little longer. You will look for me; and as I said to the Jews so now I say to you, `Where I am going, you cannot come.’ I give you a new commandment, that you love one another. Just as I have loved you, you also should love one another. By this everyone will know that you are my disciples, if you have love for one another.” John 13:1-17, 31b-35. In a terribly poignant moment, Jesus calls his disciples “little children” and tells them his time with them has grown very short. Jesus then offers them the great commandment: to love each other as He has loved us. We love each other because He loved us first, and showed us how to do it. I’ve come to believe, the more time I spend in John’s Gospel, that there’s really only one sin: the failure to love. Love serves as the glue which binds the readings for Holy Week together. Love rode into Jerusalem on a donkey. Love filled the house with a fragrant oil. Love lights the way so that the darkness will not overcome us. Love surrounds us in a great cloud of witnesses. And tomorrow, Love will be hoisted on a Cross. This entry was posted in Uncategorized and tagged Anglican, Bible, Disciple, Bible, Charity, Christianity, Death, Disciples, discipleship, Dominican Order, Episcopalian, foot washing, Gospel, Gospel of John, Holy Week, Jesus, Lent, Love, Maundy Thursday, Moral Theology, Pastoral Care, Religion, Salvation, Scripture, Spirituality, The Kingdom of God, Theology, Triduum. Bookmark the permalink. Yes, there is only love. Perhaps the real opposite of love is fear; the fear to love and be loved, to wash and be washed. I suppose, mi Padre, that this sacred mandatum answers the question posed by the old man (reported in one of your favorite blogs about the Prodigal), What about the shower? This is our shower, and our sacred re-gift. I had never experienced foot washing until I became an Episcopalian. 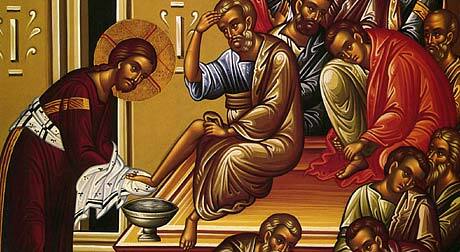 And then I learned that on Maundy Thursday it is custom and correct practice for the clergy to lead in the foot washing. I had done this from 1992 through 2009 (and have continued to do it). But in 2009 someone asked if they might wash my feet and I was completely and utterly at a loss for an answer—the dear sister didn’t repeat herself, she just readied herself to wash my feet—waiting for socks and shoes to be removed. That evening for me was the most humbling time of my life. It is relatively easy to wash someone else’s feet; it is deadly frightening to have someone wash yours when you really hope and pray you don’t need it. As a clergyman I thought it was my work to the congregation-but on Maundy Thursday we were all congregation; the equality of neediness was ubiquitous—the need for Jesus to humble us was palpable. I bless dear Christine who, for a fifty-seven year old priest knew enough to get his shoes off so he didn’t fall into the Peter—trap when Jesus told Peter to show his feet for washing. Several instances in the Scriptures make it difficult to be ministered to. This is one of them: “Not my feet, Lord.” Not me: I am not the person who needs this of you. Oh yes, I need you, but not this way—in a way that exalts you more and humbles me less. It is entirely possible to be over estimating our humility while all the time we are exhibiting it in such a way that it transforms into pride and arrogance. No doubt the Hebrew in the ditch on the road from Jericho to Jerusalem was humbled when a Samarian stopped to nurse his wounds and put him up in a place to stay and promised to pay for his care until he was well. Jews simply do not take help from Samaritans—it just isn’t done. The great preacher of Chicago in the mid twentieth century, A. W. Tozer preached, “Humble yourself in the sight of the Lord, but only humble yourself as much as you have to. Too much humility becomes a pious self-centeredness.” Ouch, I say to that. I have worked damn hard on my humility and I resent being told that I can have too much humility. Is it possible that virtues can be as deadly as vices? I contemplated long—am I too proud of my humility to admit to my pride? Everyone who thought I was such a humble man would now know the truth about me. I would lose friends and embarrass family and God said, “It is you, Jeffrey, you are concerned about.” Humility, said one person is not thinking less about yourself, but thinking about yourself less. Ouch! Again! Could an old 1913 hymn help me—help you? I have found refuge in it often when I have tried too hard and it came to mind on that Maundy Thursday night just before I took off my shoes and socks and allowed my friend to let me humble myself. Wherefore, wherefore should you try? Cleanse a single, single, sin. Only leave a stain, a stain. Into joy, to joy, and song. Fill it to the brim, the brim. Following the service in a whisper I thanked Christine. She said, “You are very welcome.” It was enough. Yes, having one’s feet washed is deeply humbling, and teaches us just how fragile our facades are. I did not know the hymn, but am most grateful I do now. Blessed Jesus, help us to also pour out love on the feet, hands, hearts, and heads of all those you bring to us. Milles gratias. Love, our only burden, our only strength. You are most welcome, my brother. I’m not sure which part of this touched me the most, my brother, the reality that to love and to be loved truly is the greatest gift, or the reminder that through servanthood – and through a willingness to be served – we follow our Lord in the best way possible. For most of us, if not all, it is far easier to love and serve than to receive either one. This was a needed reminder in my walk through Holy Week. Thank you. I think you’re right. Many of us are like Peter, unwilling to be served. It is a kind of vanity, lessening our brothers and sisters, which refuses the hands of Christ when offered. I have trouble remembering I am loved. That the whole world is. We just have to accept this to find the place God is in ourselves. I should write in the singular first person, though, because when I do, am able to find the place of peace inside of me, it’s a small bit of the world that is saved. Wished I had more time to take more time here. I promise that you are deeply, recklessly loved. Oh, love that. Reckless love. Well, Brother James, you could knock me over right now with a feather. I used to go to mass back when it was all in Latin and spent most of my time talking with Jesus, Mary, the Holy Spirit, and anyone else who happened by. It is the shaman in me. I grew up with the Latin mass as well….there’s something very rich (although perhaps a bit less democratic) about having a language set aside for the sacred. It reminds us that not everything is ordinary. Whatever Latin I have, and that’s not much, is a vestige from those days.